Dixie Elieen Whitley Mathews was born to Odessa (Evans) Whitley and James Birdie Whitley on September 4, 1944. Dixie grew up in the prairies of New Mexico and west Texas. During her 74 years, Dixie has been a homemaker and housewife and had a few part time jobs. Dixie loved working at Stillwater Milling feed store where she made many life long friends. Dixie liked to play cards and visit with her friends, but most of all she loved to travel and see new places. Her favorite places to visit were Ruidoso, New Mexico, Eureka Springs, Arkansas, and Las Vegas, Nevada. Her favorite trip of all was an Alaskan cruise with her husband, Jim. She loved watching her kids and grandkids growing up and could always be found at any sporting events supporting her loved ones. Dixie will be missed by many friends and family. We will always remember her generosity and putting others before herself. She was preceded in death by her parents and 2 great grandchildren. Dixie is survived by her husband James Mathews of the home; two sons Kevin Wilda and wife Tammie of Chickasha, Troy Wilda and wife Pamela of Guthrie; two grandchildren Trisha Wilda of Pueblo, Colorado, Heath Wilda and wife Daryl Ann of Perry; one great granddaughter on the way; many nieces and nephews; and stepsons Scott and Chris Mathews and grandson Dane. The family would like to express a great deal of gratitude to Barbara Wilson and Frankie Langford. There will be a time of reflection with the family at Trout Funeral Home's family room from 3:00 - 4:00 p.m. on Tuesday, January 22, 2019. 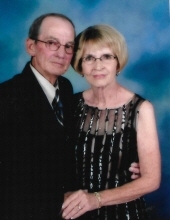 In lieu of flowers, memorial contributions may be made to the American Cancer Society in care of Trout Funeral Home of Perry, 1408 N. 7th St., Perry, OK 73077. The family would like for you to leave your condolences and memories of Dixie at www.troutperry.com. To send flowers or a remembrance gift to the family of Dixie Eileen Mathews, please visit our Tribute Store. The family would like to greet everyone that can to come by the funeral home and visit with them. "Email Address" would like to share the life celebration of Dixie Eileen Mathews. Click on the "link" to go to share a favorite memory or leave a condolence message for the family.